Ohio Farm Bureau’s AgriPower leadership group toured the farms of several Florida Farm Bureau members in the central part of the state, Feb. 22 – 24. The group was comprised of 23 Ohio Farm Bureau members and the director of leadership programming for Ohio Farm Bureau. The AgriPower institute is a leadership program designed for farmers and agribusiness professionals and focuses on public policy issues confronting agriculture. The group’s programming is comprised of seven sessions that educate the group on government, media, advocacy, other state’s agriculture and service opportunities. The group was able to tour eight farms and facilities including FernTrust, Inc., Evans Fish Farm, Vo LaSalle Farm, H&A Farms, Southern Hill Farms, Wish Farms, Fancy Farms and Deseret Ranch. 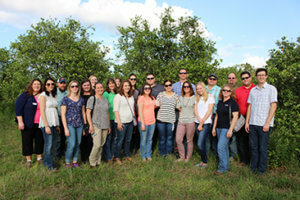 Each tour gave the groups a different look at the variety of agricultural commodities grown in the state of Florida. With each visit came questions of public policy and each farmer’s opinions of issues facing agriculture in Florida and the nation. The participants noted many of the issues Florida farmers face are not all that different from those facing the rest of the nation. One participant remarked difficult challenges Florida farmers face are hurricanes and invasive species. Stacey Stark, AgriPower participant said Florida farmers combat the challenges with diversification of their agricultural production.